All the standard waveforms you would expect (sin, square, triangle, saw, noise)- and you can also import ANY waveform you like! Simply add a .wav file with the waveform you want to hear to the Data Folder (as specified in the Config Dialog) – stereo or mono, any samplerate or bitdepth you like, and Atlantis will let you use it for oscilators and LFOs. Samples are upsampled into very high resolution wavetables. Every slider parameter can be controlled by ANY modulator. LFOs, Envelopes, MIDI Control Data, the current note, velocity, follower, or combinations of them can be used to modulate your sounds into expressive organic creations previously unheard by human ears. What synth would be complete without selectable Polyphonic, Monophonic, Portamento and Arpeggio modes? All that, it’s fast and it sounds great, too? What the hell?! 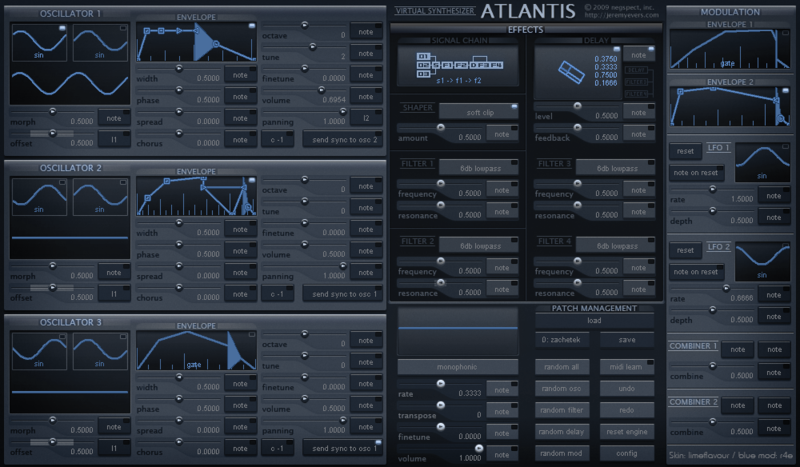 Here's a package of Presets and a nice skin for Atlantis VSTi. adds + sets the skin in the atlantis settings. Thank you. Would you say this synth is any good, being able to compare them to the more well known and popular ones? quote by r4eHere's a package of Presets and a nice skin for Atlantis VSTi. Sooooo much nicer than the not so nice one. Thanks so very much. I always have loved this synth and now it is even better. Music is always a commentary on society. Thanks r4e btw what does your name mean? My name has several meanings. The first was (from german translated) something like "retarded for ever" cause when I invented my name, I played alot of games online and everyone pretended to be a "pro" while I told everyone that I'm a complete moron who can be shot easily. That way all these "pro's" came out of their corners for an easy job and then got owned by me, haha. Then it turned into "ready for everything" as the problem solver for any pc problem from friends and friends of friends and people online etc..
After some time I started developing scripts & tools to solve time consuming problems in seconds and so I called myself self-ironic as "recognized for excellence" (which btw. is an internationally recognized award from the European Foundation for Quality Management in business - short R4E) just because it sounded so excessive. Later I changed it again into "reversing for eternity" and sometimes I still use it in the first meaning just for fun. I thought that your name was Rafael, Raffi, or r4e for short.